Ask an Expert: Should Divers Reveal Their Medications? Even as a small boy paddling around the swimming pool, Doug Sitter never had a problem putting his face in the water. In fact, he didn’t mind putting his whole body under the water – sometimes a long way under it. Doug, now 33, is a “freediver ,” a small but growing group of enthusiasts who train their bodies to dive deep without scuba equipment. Those at the top of the sport can descend more than 300 feet using just the air they inhale into their lungs before descending. “I started out as a young boy, diving for the rings at the bottom of the pool,” says Doug, who quickly found he needed more water than that to satisfy his urge to go deep. In his early childhood, his family lived in Deep River, Ontario. The Ottawa River was nearby and he was soon diving there “to see how deep I could go.” Doug would go on to become Dive Master and a certified NLS lifeguard. His water world expanded when he developed an interest in scuba diving from his fourth grade teacher. 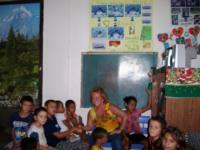 On returning from a dive trip to the Bahamas, the teacher told students of the underwater experiences there. Doug took up scuba, became certified, took more advanced courses such as enriched air nitrox and became a Dive Master. All this while still a teenager. But he was also comfortable being underwater without scuba gear. By then, his family had moved to Exeter, Ontario, which brought Doug in contact with a sport that would lead to freediving. Just to the south of Exeter, in the city of London, Ontario, there was an underwater hockey league that interested him. The sport was a natural fit for Doug. At the bottom of the pool, players battled for control of a lead-filled puck using only speed fins, mask, snorkel and a short stick. “It was all about speed and stick movements,” Doug recalls. ( Association Internationale Pour Le Dveloppement De L’apne ) Doug is the current president of Free Dive Toronto and vice-president of AIDA Canada. AIDA Canada looks after education and how to develop both recreational and competitive free divers. This includes setting the standards for who represents Canada at the world championships. Doug competed for Team Canada in the 2006 world freediving championships in Hurghada, Egypt that saw the Canadians place eighth out of 25 countries. But for Doug Sitter, exploring the underwater world and experiencing nature up close was always the central interest of his water sports. To him, training the recreational diver in a sport that can be enjoyed by people of a wide range of ages is every bit as important as training the elite divers for international competition. Doug says a freediver can see a lot in just 15 metres of water, which is easily attainable for even most recreational free divers. Scuba gear isn’t something you’re likely to carry on a hike in to a remote area that you may want to dive. Instead, scuba has its place in pursuits such as exploring ship wrecks and caves. Doug says the recreational side of freediving suffers from negative press of rare accidents caused by individuals who haven’t been properly trained and may not even know what freediving is or what risks are involved. It is important if people are interested in getting involved they should find an AIDA affiliate club in their area and start making inquiries,he adds. Freediving goes back centuries to ancient Egypt and China. People have always used their ability to extend the depths of their dives to collect food, shells and other objects on the ocean floor. The sport is beginning to grow in Canada and currently it has clubs in this country’s three largest cities – Toronto, Montreal and Vancouver. As in golf, the competitive freedivers can serve as a measuring stick for those who just participate for the exercise and fun. To that end, there three main categories of competition: dynamic, static and constant ballast. Men: 250 metres with fins and 213 m without. Men: 11 minutes, 35 seconds. Women: 8 minutes, 23 seconds. Men: 122 metres with fins and 88 metres without. The idea is to test freedivers for time, depth and distance. Equalizing pressure in the ears is a focus in depth training. Techniques include: Valsalva (holding your nose and blowing out to clear your ears); and Frenzel (holding air in your mouth and using the tongue to piston the air into the ears). Staying relaxed is crucial. Panicking quickly uses up the finite supply of air the diver takes into his or her lungs. And obviously, a mental breakdown deep in the water is something to avoid. Training also includes a video analysis of a student’s kicks. Efficient kicking is central to performance. Usually, much larger fins are used, sometimes one very large fin that is propelled by both feet. “Long-blade fins are super effective and powerful,” says Doug, but he cautions that you need training and conditioning to use them. Those who haven’t yet developed that strength are better to start with shorter fin blades because the long ones will quickly tire them out. Doug was on the Canadian safety team at the world individual depth competition for freediving in Long Island, Bahamas Nov. 24 to Dec. 5. That is a favourite site for freedivers because it is the home to Dean’s Blue Hole, the deepest blue hole in the world, extending 300 metres below the ocean floor. Canada’s team did well in the event. William Winram, who is from British Columbia but is now living in Switzerland, reached a depth of 86 metres in the “constant weight, no fins” men’s event. (Constant weight means the competitor must return to the surface with any weight he wore on the way down. This is opposed to variable weight, where the diver can discard the weight before returning to the surface.) Winram’s dive won him the silver medal and was just two metres short of the world record. That record was shattered by the gold medal winner, who descended 90 metres. In the women’s constant weight, no fins class, Jana Strain of Calgary (now living in California) finished fourth and set a Canadian record with a dive of 54 metres. The event was injury free. To protect competitors, safety team members go down 30 metres, stay there for a full minute, and still have enough left to assist a free diver in trouble up to the surface. The divers will have gone as deep as 120 metres without air, so if they’re going to have trouble it’s most likely to be in the last 25 to 30 metres on the way back up. Fitting safety team members with scuba gear is not an option because it’s crucial to get a freediver in trouble to the surface as quickly as possible. 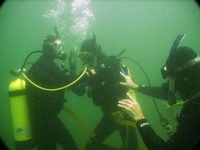 A scuba diver would have to surface slowly to avoid problems with decompression. A freediverusually does not have to worry about the bends because he or she is not breathing compressed air. The common characteristic of all the top performers in the sport is that they are “very relaxed people.” That is why you will often see professional people doing the best in the sport because they are accustomed to dealing with the mental side. Freediving is not a sport solely for the young. In fact, many of the top competitive divers are in their 30s and 40s. But that’s nothing. Tom Elliott, who runs an underwater rugby program in Brantford, can hold his breath for 5:47. He is 73.